I made the communion bread for church for December (and am hoping to do it every month in the future) and I'm proud of the results of the rustic recipe from King Arthur Flour. After the breads have cooled over night, I take the crust off of one and a half of the loaves. I cube the bread. The half loaf that remains is partially cut through. The pastor uses this half loaf and pulls it apart for the congregation during communion. The cubed bread is divided into two piles, one pile for each aisle in church. In my denomination, the United Church of Christ (Congregational), we have communion on the first Sunday of each month. Every person is invited to participate, so we want to be as inclusive as possible. This recipe is sugar free, which hopefully will be acceptable for diabetics. The King Arthur bakers have a blog now, and this wonderful and versatile recipe can be found at the No-Knead Crusty White Bread blog post. It is perfect for chili or soup. You can make it all different shapes and textures. 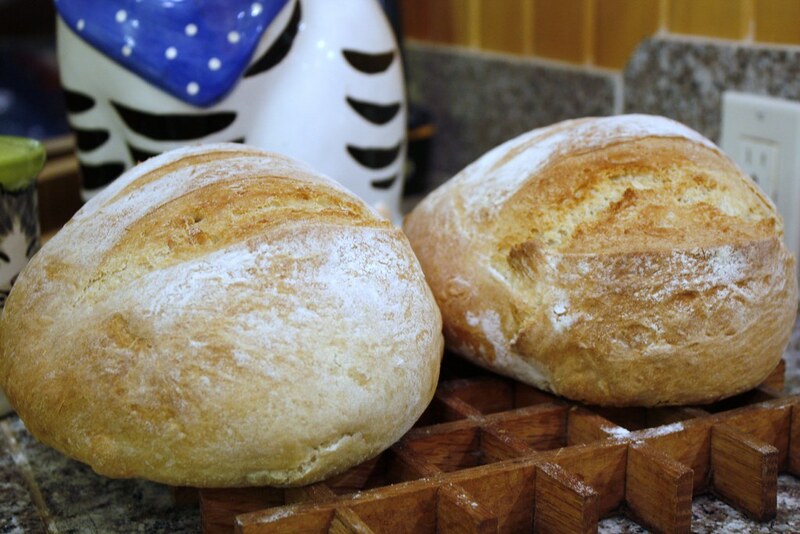 This really is the easiest bread you will ever make in your life! Try it! But this bread is not gluten free. Since I had never made bread without gluten (can it be called bread if it does not have gluten? 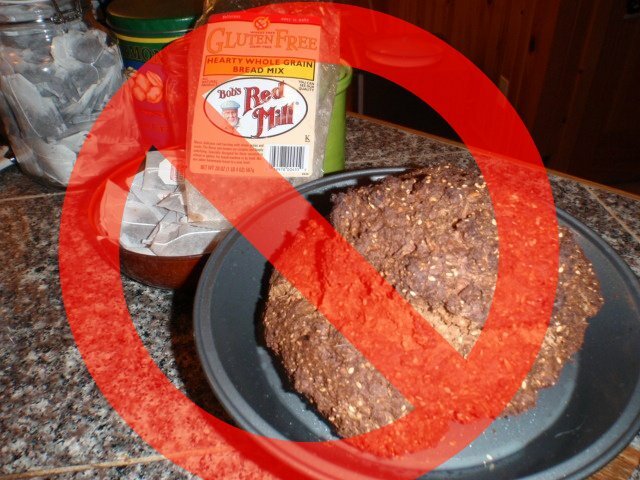 ), I bought a Red Mill gluten free bread mix. I followed the directions religiously. Even though the dough of the gluten free loaf felt like a pile of bird seed, I was hopeful that it would be a good alternative for the gluten free folks. It actually smelled quite good in the oven. But it was quite a disappointment. It was nearly impossible to determine when it was finished baking. It was nearly impossible to slice. And it was impossible to eat. It was tough cardboard. We tossed the gluten free loaf out for the birds. It is still there to this day, buried in the snow. The birds won't touch it. I'm definitely going to buy the book from which my communion bread recipe came. I'll have fun this winter trying all the quick rustic breads. You can't err when making these simple breads, so don't be intimidated by bread making. Click the link below!